Marriott Rewards Makes SPG All Suite Hotels Finally Available At Advertised Rates! 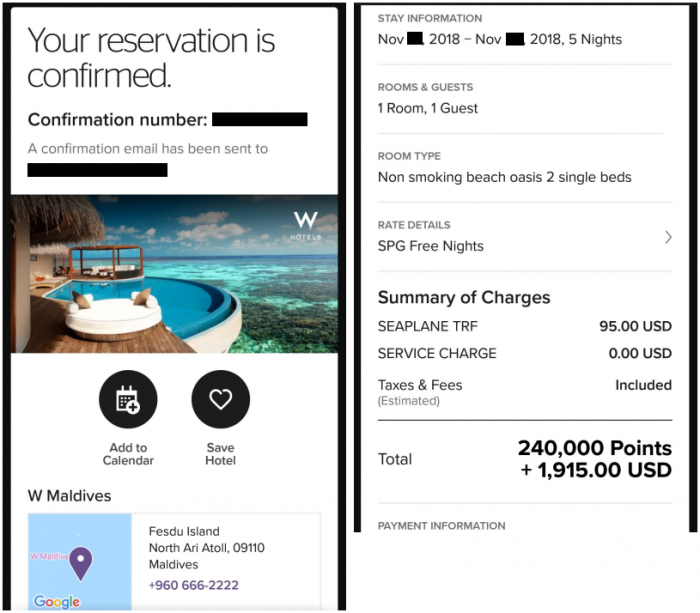 When Marriott Rewards published the combined award chart back in late June (read more here), it made clear that all previously very expensive SPG All Suite hotels would be available at category 7 point pricing once the programs are combined without extras (premium pricing) before moving to category 8 next year. That has been not the case until now, however, as we have previously covered (read more here – includes list of these hotels) on LoyaltyLobby. Marriott Rewards has finally made these hotels bookable using these disclosed rates but you may have to use app (I was not able to book using the website). I previously covered how Marriott was teasing with these properties when I was trying to book St Regis Bora Bora (read more here) but the booking always failed at the last step. You can now book it but there is very little availability. The St Regis Maldives was not previously bookable at the 48,000 points per night either when the fifth night free is factored in. And Le Meridien Bora Bora. The boat transfer and turtle donation should be in XPF and not in USD. You have to pay great attention to the cancellation rules of these award reservations. The Le Meridien Bora Bora is supposedly completely non-refundable 11 months prior to scheduled arrival date that I find very difficult to believe. The award availability at these SPG All Suite hotels is going to be very limited because the number of “standard” rooms at each is probably in low single digits. Not sure what the dollar amount is on these on screen confirmations? Taxes and fees are included on these award reservations.